SPF/DKIM records are necessary in order to help prevent your email addresses from being spoofed, which lets unauthorized party to forge emails using @yourdomain.com mailbox. 1. Login to your cPanel dashboard. 2. From the main page look for the Email category. From there click on the Email Authentication icon. 3. This brings you to the Email Authentication screen. Begin by finding the SPF/DKIM subsection, which is the vast majority of the page. Scroll down the page and check the check box for All Entry (ALL). NOTE: This is important as it adds the '-all' to the end of the record so that all addresses that fail the other checks will be rejected. 4. Now that you have set the basic SPF settings, scroll back up to the top and click the Enable button for both SPF and DKIM section. 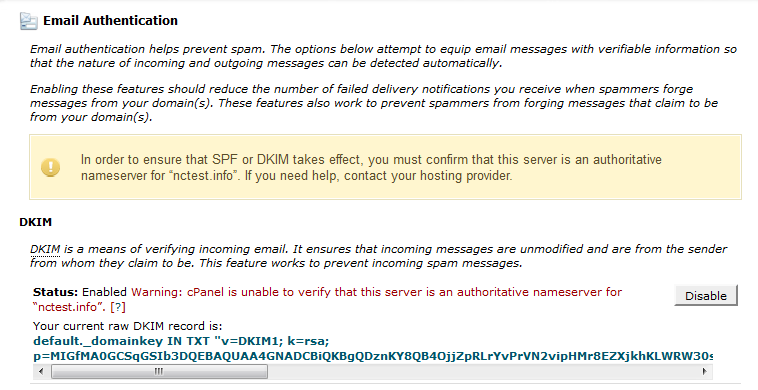 NOTE: You may see the following warning about authoritative nameservers right after enabling. 5. Allow some time to pass for the records to propagate and refresh the page afterwards. The warning should go away and DNS checks will be passed.